Furnaces were working fine and started blowing cold air on night, was not out of propane. We just got our 31 foot travel trailer it has a holding tank heater there is a switch inside of the camper. When the heater is on should the switch light be on? No matter what way the switch is, the light isn't on ? In my motorhome, if the heater does not ignite within the first 45 seconds after the thermostat turns the heater on, it will stop the gas flowing to the heater, but the fan does not go off. The result is that the fan stays on, blowing cold air, until I turn the whole thing off by turning the thermostat to 'off' and waiting until the fan shuts down a few minutes later. I leave the heater off for a few minutes (just to make sure it's completely reset) and then turn the thermostat on again. In every case so far, the heater has lit and the air is warm and all is well. This doesn't happen often, but it has happened two or three times over the last year (I'm a full-timer). 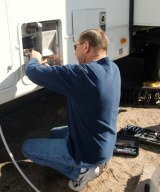 Your RV may have a similar safety system, so this may work for you as well. If you're handy it may be worth trying to clean the propane / gas hose connections? Otherwise it may be the control board is faulty. If not try taking to an RV shop where they can test, the regulator and control board.